Living... a quiet suburban life in Idaho. Well, it’s quiet until his brother decides to visit and never leave. Stewart’s brother Dean played the title role on the TV law drama The Grinder, but when the show ends, he craves a small town experience and expects Stewart to provide it. Profession... attorney at Sanderson and Yao. They handle small time cases and minor disagreements but when Dean decides to bring in his over-the-top Grinder persona to help in court, the entire practice is turned upside down. Relationship Status... happily married with two children. His wife, Debbie, is always on Stewart’s side when it comes to Dean but his kids idolize their uncle. His son Ethan wants to become an actor who meditates just like Stewart’s brother, and his daughter Lizzie loves curling up after a long day at high school with a marathon of The Grinder. Challenge... Dean. Stewart is often tasked with cleaning up his brother’s messes brought on by the former actor’s cluelessness and endless confidence. And this happens both at home and in the office. Dean sticks his nose into the kids’ school lives and into his practice’s cases, and only complicates matters in both. Personality... pragmatic, logical, and constantly bewildered by his brother’s behavior. Stewart does everything by the book, especially when Dean wants to throw out the book and work from five-year-old Grinder scripts. He’s always been in Dean’s shadow and is frustrated that his staff at the office listens to Dean as much as they do Stewart, even though Stewart actually, you know, worked hard and went to law school. Stewart Sanderson's popularity ranking on CharacTour is #4133 out of 5,000+ characters. See our top-ranked characters and read their profiles. 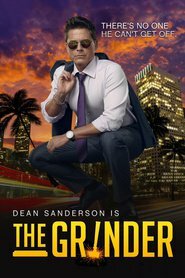 Television lawyer Dean Sanderson moves back to his small home town after his hit series, "The Grinder," is canceled thinking his time on TV qualifies him to run his family's law firm.